Postcards are a proven and cost-effective method of direct marketing to a targeted audience. 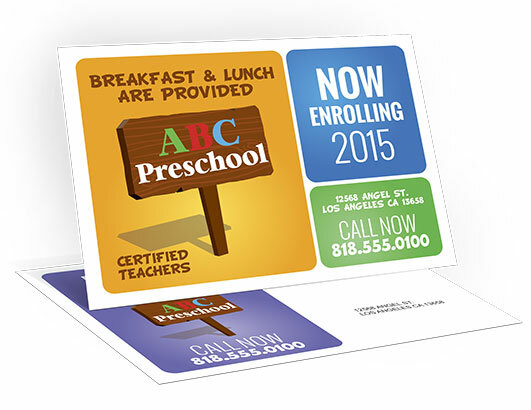 We print vivid full-color post cards and can save you time and money on the mailing, too. Chances are, you routinely receive promotional postcards in your mail. They are widely used by businesses because they get attention: They practically jump out of the mailbox in full glossy color! “Variable data and images” is a digital printing method that allows for different text, images and graphics to be printed from one card to the next within the same print job. This means that even if you are sending thousands of postcards, each can be customized to the recipient to contain their address, a specific image and/or personalized text. This enables you to achieve more targeted, one-on-one marketing. A direct marketing campaign utilizing postcards is the most cost-effective way to reach potential customers, to increase sales to existing customers and to rekindle relationships with former customers. Postcards also save time because postage can be printed onto the card and the cards are self-mailing (require no folding, stuffing, etc.) And because we are up-to-date on changes in postal regulations, we can save you as much postage as possible on large mailings . Contact us today to find out more about our postcard printing and mailing services.